Gilt-brass Figural Mantel Clock, France, c. 1840, the standing figure and five-string instrument flanking the flat-top case with a floral decorated lyre, torch, and wreath above the 4-in. 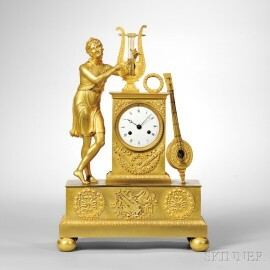 Roman numeral porcelain dial with Breguet-style hands, applied floral spandrels with a torch and floral scene below, lower section with circular rose and swag wreaths flanking the cornucopia of instrument in the center, all resting on bulbous bun feet, eight-day time and count wheel strike mechanism with a silk thread suspension, ht. 21 in.